Just to give some perspective on the photo in my last post, I took this photo while on a walk yesterday. It’s maybe a couple hundred yards from my front door. 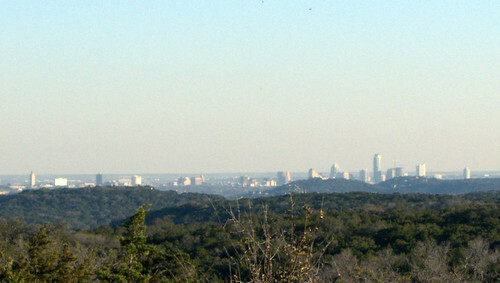 It’s a shot looking back downtown from the hills west of Austin. The camera’s zoomed a little but I also cropped it so there’s some ‘optical zoom’ going on here. It’s easily 10 miles plus from this vantage point to downtown and with this lens and zoom there’s definitely some loss of clarity. Still, it’s not a bad view. The tallest of the buildings in the picture is the Austonian, which I also pointed out in the previous post. And again for perspective, the left most tall building in the picture is the University of Texas Tower.